My mom and her best friend Debbie are visiting Mendenhall Street this weekend. They arrived yesterday from Florida right in time for some really dreary weather! Luckily, my mom brought all the ingredients to throw together an easy comforting pasta dish for dinner last night. She wanted to attempt to recreate her favorite dish on the menu at Leonardo’s 706 in Gainesville, Fl – the Chicken Gorgonzola Pasta. Leonardo’s is a favorite of mine in Gainesville – and is now run by my childhood friend, Aaron! Check it out next time you’re visiting the swamp. 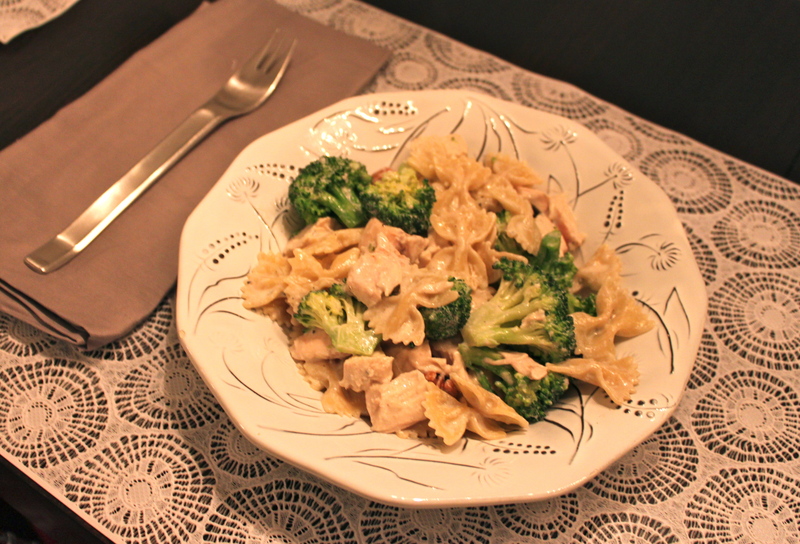 We recreated this dish using half-n-half instead of heavy cream, roasted chicken breast, blue cheese, broccoli and bow tie pasta. I don’t remember the exact measurements – and really they don’t matter too much. Really, you just want to reduce the cream and add a touch of white wine and enough gorgonzola cheese for a nice bite. Preheat the oven to 400 degrees. Roast the chicken breasts on a cookie sheet – drizzled with a touch of olive oil, salt and pepper – for about 30 minutes or until browned. Allow to cool, remove skin and discard and chop chicken into bite sized pieces. Meanwhile, in a large deep skillet, add about a cup or so of half-and-half. On medium heat, bring to a slow simmer. Add crumbled gorgonzola cheese and a splash of white wine. Reduce until thick. Meanwhile boil pasta – and throw in the broccoli during the last 5 or so minutes to cook too. Drain pasta and broccoli and throw into cream sauce. Add chicken and pecans. Taste for seasoning – the cheese is super salty so wait until the end to add salt and pepper to your liking. I am sooooo making this. sometimes I forget to tell you how much I enjoy your blog. keep it up! Do you think this would be good to take to a family with a family member recovering from surgery or is it too tast specific? Can’t decide what to take…. I think it would be nice! And, you can add less blue cheese if you think he/she wouldnt like too much. Just taste as you go! And… you could also replace the blue cheese with parm! I live in the ‘ville and this is my favorite dish at 706. I decided to check Google for a recipe, and when I listed the ingredients, I found your blog post. Hurrah!! Can’t wait to try it.